As anybody who reads my blog may know, I often write blog posts upon request. Many of them I’ve written because my own graduate students, undergraduate students or research assistants ask me to help them out with a particular component of the research process. Others, I write because faculty, students or practitioners ask me whether I can outline a particular component of the research process. Dr. Pamela Scully (Emory University) asked me if I had written a full protocol on how to write a paper, from having an idea to developing the full manuscript. Here is my blog post version of a Twitter thread I posted in response to her request. @raulpacheco have you done step by step description of moving from an idea, doing reading, taking notes, conceptual synthesis, then writing? As I said in my response to Dr. Scully, there’s at least two methods of going about writing a paper. The first one I have outlined in my blog post here, on the From Idea to Paper Protocol. 1. Generate an idea for a paper through brainstorming. My blog post on how to generate ideas for new papers can be read by clicking on the link. Generating ideas is not always easy because we academics seem to have this crippling fear that somebody already thought of our brilliant idea. Maybe they have, but maybe they have not. 2. Evaluate whether you have found a gap in the literature. Doing a citation tracing process on specific papers that you deem important helps find whether there is a gap in the literature. You run your citation tracing and then evaluate whether all the literature converges on one particular idea or set of ideas once you’ve reached conceptual saturation. 3. Start reading and synthesizing the literature you find. I’ve also written on how you can expand your synthetic note and make it into a full-fledged memorandum. There are obviously cases where will want to collect all your synthetic notes and create an annotated bibliography. That depends on the type of scholarly output and research product you are trying to generate. 4. 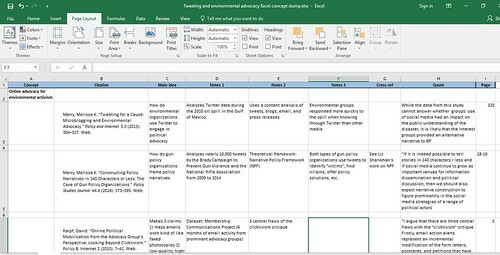 Use the AIC Content Extraction Technique if pressed for time and throw into your Conceptual Synthesis Excel Dump. When you are dealing with a new field, you often find that you need to read A LOT of sources before converging on the right ones. One strategy I use when this happens to me is that I run AIC Content Extractions on all the pieces I am supposed to be reading, and then I dump each AIC item into a row on the Conceptual Synthesis Excel Dump I created for the topic or for the paper. 5. Remember that AIC is the most minimalist reading strategy, but you may need to vary accordingly. There are pieces that are worth skimming, others are worth engaging with at the meso level, and others need to be read in-depth. You are the only one who can decide when you’ve read enough and when you’ve done a deep enough literature search and review. But remember, AIC is the absolute, bare minimum you have to do. 6. Once you have a bank of research products, you can decide what to do with them. Remember, only you can decide what you’re trying to write. Is it a literature review? Is it an annotated bibliography? Do you need to provide someone (a granting agency or your students or colleagues) with a bank of rhetorical precis or a database of synthetic notes? Is the Conceptual Synthesis Excel Dump enough? This is a very personal decision. You can decide what type of scholarly output or research product you’re looking to generate. 7. Follow these 8 steps to structure a paper. I find that often times, going through this eight step sequence helps me create at least the very bare bones of a skeleton of a paper. 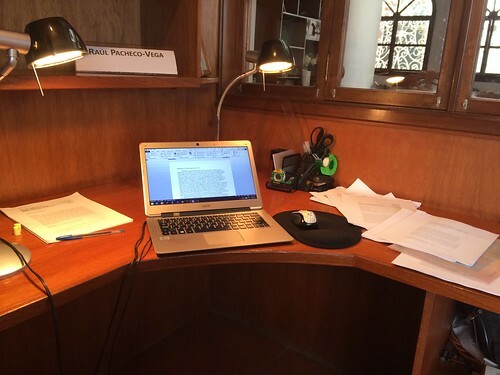 As you can see, I am someone who tends to start with the abstract and expand the paper from there. My Drafts Review Matrix looks like this https://t.co/4PizJFmu53 I send the paper to people who might read it and give me feedback. This matrix is useful both when you’re doing a Revise-and-Resubmit or when you have asked someone to read your draft paper and you want to make changes they’ve suggested. Or when you’re polishing a draft of a document. Perhaps the most challenging moment for me is when I think a paper is ready for submission. Or when I’m doing a revise-and-resubmit. Crippling fear can creep up and make me think “no, this paper isn’t ready for submission”. What I do is I ask friends to read the paper and then make the changes they suggest. The #GetYourManuscriptOut crowd really helps me out with this, because it’s very motivating to see that others are working hard to get their own papers out too. As you can see, I combined what I’ve written on reading strategies, literature reviews and academic writing into one single protocol. For faculty, I hope this helps you show your students how to write a paper. And for students, I am hoping this document will provide guidance on a topic whose mechanics are often problematic to grasp! Tagged with AcWri, protocol, writing.